When it comes to GTD, after a year and a half of finding the ultimate solution on Android/Windows, I have settled for Nirvana HQ. Nirvana meets the following criteria which in my mind, are critical in order for a solution to qualify as a GTD solution. Firstly, it achieves that Holy Grail facility of “auto next action”. When you create multiple projects (I believe you need to be a subscribing customer in order to be able to create more than five projects) the various “next” views that you utilise (by context, area etc) will only be populated by the top tasks in your various projects. When you mark a tasks completed in that view, Nirvana will then automatically refresh your current “next” task list by selecting the next sequential task from the project in question. Nirvana HQ is platform agnostic. The main interface is web based. The features are amazing in such a cheap solution. (Free or $39US per year). They have a mobile site for use on tablets and mobile phones. There is offline access too. Currently there is an iPhone app (which you can also use on the iPad) and the Android client is in beta. I have been part of the alpha and now beta program. They allow tagging tasks with multiple contexts. Some GTD solutions only allow you to tag a task with one context. This is a good discipline but sometimes it can be a little inflexible. In addition, the developers and community are incredibly helpful and active. If you are looking for the ultimate solution, check them out. Seriously, after one and a half years, I don’t think it gets any better than this. If you reckon there is something better, I’d love to hear from you! I don't agree with you dannielo. I found the Android app to be very sub standard and buggy, not to mention limited to the point of being crippled unless you purchase a subscription. On the subscriptions, I found them to be shockingly over priced compared to other offerings. I've read through the reviews in the Google Play store and the bay majority of reviews agree with my assessment. Couldn't agree with you more, Stephen. I'm a former Omnifocus user. "Auto- next-action" is the key! I'm a former user of Omnifocus, which is, in my opinion, a perfect implementation of GTD... but Omnigroup is committed only to developing for the Mac ecosystem. It was fine for me before I owned a smartphone, and just walked around with my iPod touch in my pocket to manage my tasks via Omnifocus. But once I purchased my first Android smartphone, I couldn't justify carrying two pocket-sized computers everywhere, so I ditched Omnifocus and settled for other, less-than-optimal task management software. I've been without a good GTD software tool for almost three years. Three agonizing years. I'd stumbled on Lifehacker's post about Nirvana a year or so ago, but didn't end up committing to it because they didn't yet have a native app for Android (or iOS, for that matter), and even though their webapp was good, it was still a webapp. At the time of writing this, though, Nirvana's Android app is entering the later (hopefully final) stages of Beta, and it is GREAT! 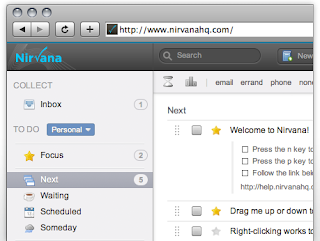 I can't say enough positive things about Nirvana's implementation of GTD. Hey anonymous. 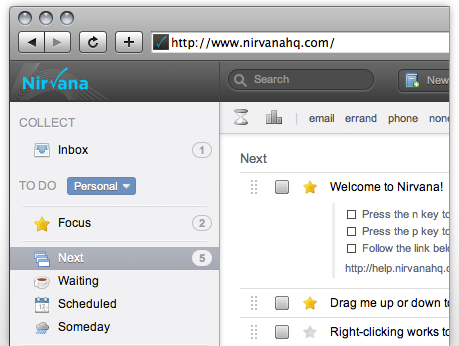 I am actually a Nirvana HQ beta tester! And I like what I see! They have asked that we don't promote the product until they go live hence my muted post, but in terms of what you have reflected back here, yes it is several kinds of awesome. Thanks for leaving a comment.